There are variations of the wood window. Partial wood construction is a good option. These photos show opposite sides of the same window. The wood is exposed on the interior side for the appearance. The exterior side is clad in vinyl or aluminum for enhanced durability and easier maintenance. The wood/clad window seems to give you the best of everything. It has the wood look on the inside where you really want it, and the moisture-proof protection of vinyl on the outside. 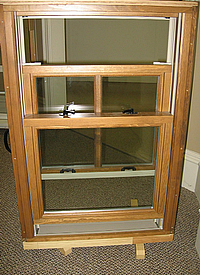 But this will be an even more expensive option than the all-wood window. Note that the extra expense of wood windows will usually not be recouped if you sell the house. 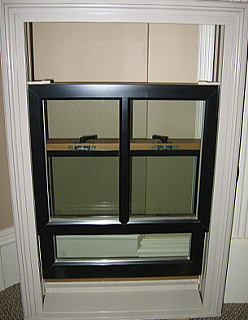 Windows are an afterthought for the typical house buyer. Buyers tend to pay little attention to windows unless they stand out for some negative reason, such as being too small or too few of them. You should consider wood windows for the aesthetic value they provide to you, not as an investment in building a superior house.